'Tis the season for popsicles, and nothing is better than the handmade variety. 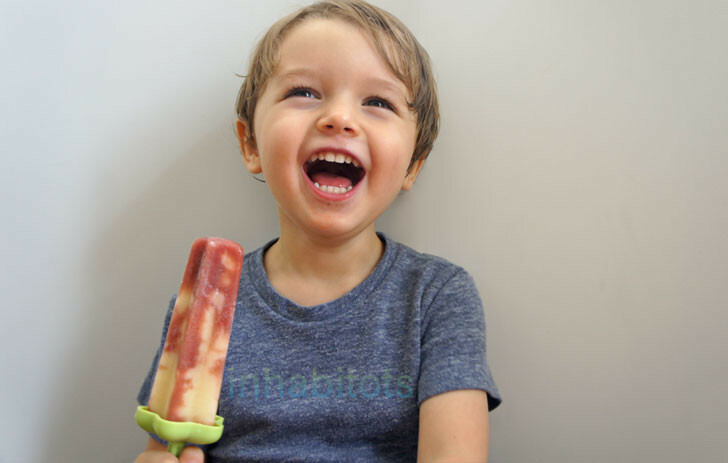 Not only can you get super creative and go in for all sorts of fun flavors, but popsicles are a whole lot healthier when you make them at home, sans high fructose corn syrup and weird artificial food dyes. Making popsicles at home saves money, and it's a great way to make use of leftover fruit, veggies and other food that you want use up. It's also a fun activity to engage young kids - it's educational, thrifty and creative - and isn't nearly as complicated, messy or dangerous as cooking, yet still produces the same kind of satisfaction at the end of the process when the whole family gets to enjoy the frozen fruits of their labor. You can easily make healthy homemade popsicles that look as appetizing and professional as the store-bought variety, and taste a heck of a lot better - you just need to invest in a good, sturdy popsicle mold set (or 3). 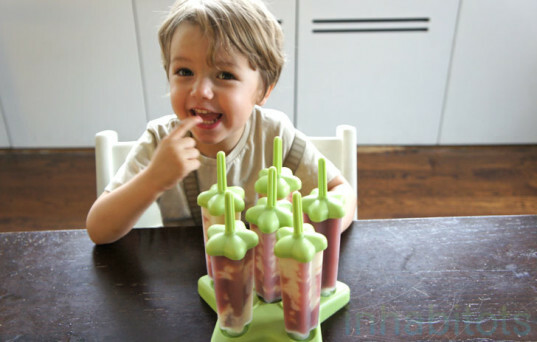 I’ve tried a bunch of DIY popsicle molds and eventually popsicle mold sets. Hands-down the best brand is Tovolo. 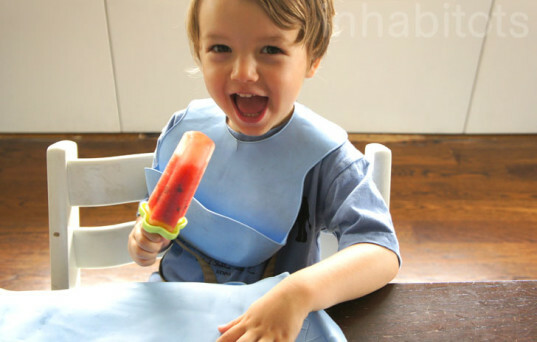 Before discovering Tovolo popsicle molds I used to try to make popsicles using ice-cube trays and bags of popsicle sticks. Believe me, it is not worth the effort and mess! You will never eat your tiny ice cube popsicles if you can’t pry them out of the icecube tray, and then you will give up and throw the whole mess in the sink. Don’t waste your time with such shenanigans as I did. Also, do not waste your time buying sticks that run out because then you have to get refills constantly. Real popsicle molds that come with their own sticks and stands (ahem, Tovolo) are infinitely reusable and a million times easier to work with. They also come in all sorts of silly colors and shapes that your kids will probably like. Personally, I’m waiting for a more sleek and modern looking popsicle mold but no luck yet – Tovolo, hit me up when you make one that isn’t fluorescent green “rocket shaped” or hot pink “heart shaped.” How about “cylinder shaped” with a white stick? Seriously though, Tovolo molds can’t be beat. You can find them all over Amazon. You can make refreshingly delicious, nutritious popsicles out of just about anything. Have a bunch of overripe mangos? Avocados that you need to eat before they go bad? A gigantic watermelon that you can’t finish? Leftover smoothie in your blender? All have been great popsicle fodder for me. 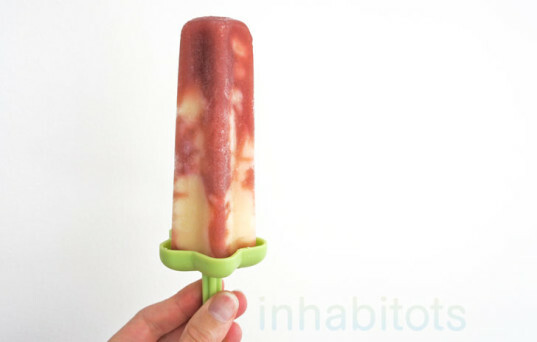 Personally I’m a big fan of popsicle experimentation and have concocted a bunch of homemade delicious recipes like apple-cinnamon, avocado-mango, blueberry-yogurt, chocolate-almond and watermelon-mint. If you need inspiration, check out some of the ideas here, here, and in Fany Gerson’s amazing Mexican popsicle book Paletas. Any fruit that is not already liquified needs to be done so in a blender, and this is a good point to experiment with sweetness and consistency. I’ve personally found that popsicles are creamier when they have a thicker consistency, so I like to pour my popsicles when they are about the consistency of a smoothie. Engage your little one by putting him in charge of the blending (from a distance of course) and the pouring into molds, so that he/she can really feel part of the action. Most popsicles freeze in about one hour, depending of the temperature of your freezer. Enticing article, Jill! I just ordered the ice cream pop molds- my daughter LOVES ice cream, so this way she can have what looks like an ice cream cone, but with healthier fruit and veggie based ingredients! 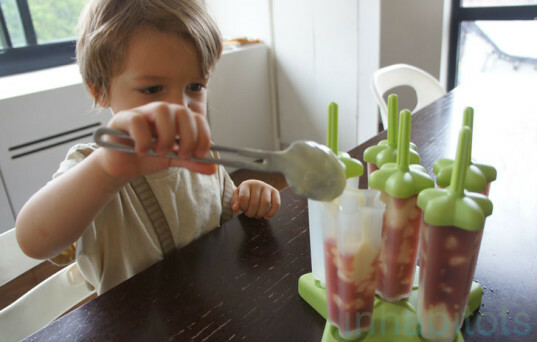 I've tried a bunch of DIY popsicle molds and eventually popsicle mold sets. Hands-down the best brand is Tovolo. Before discovering Tovolo popsicle molds I used to try to make popsicles using ice-cube trays and bags of popsicle sticks. Believe me, it is not worth the effort and mess! You will never eat your tiny ice cube popsicles if you can't pry them out of the icecube tray, and then you will give up and throw the whole mess in the sink. Don't waste your time with such shenanigans as I did. Also, do not waste your time buying sticks that run out because then you have to get refills constantly. 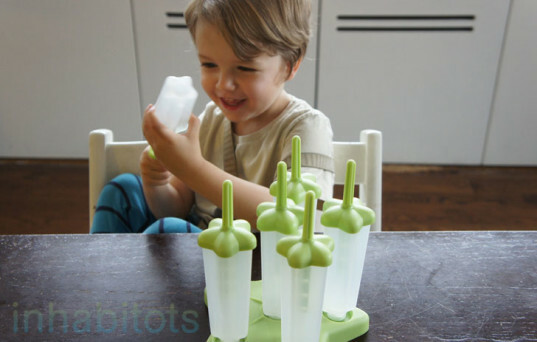 Real popsicle molds that come with their own sticks and stands (ahem, Tovolo) are infinitely reusable and a million times easier to work with. They also come in all sorts of silly colors and shapes that your kids will probably like. Personally, I'm waiting for a more sleek and modern looking popsicle mold but no luck yet - Tovolo, hit me up when you make one that isn't fluorescent green "rocket shaped" or hot pink "heart shaped." How about "cylinder shaped" with a white stick? Seriously though, Tovolo molds can't be beat. You can find them all over Amazon. You can make refreshingly delicious, nutritious popsicles out of just about anything. Have a bunch of overripe mangos? Avocados that you need to eat before they go bad? A gigantic watermelon that you can't finish? Leftover smoothie in your blender? All have been great popsicle fodder for me. Personally I'm a big fan of popsicle experimentation and have concocted a bunch of homemade delicious recipes like apple-cinnamon, avocado-mango, blueberry-yogurt, chocolate-almond and watermelon-mint. If you need inspiration, check out some of the ideas here, here, and in Fany Gerson's amazing Mexican popsicle book Paletas. Any fruit that is not already liquified needs to be done so in a blender, and this is a good point to experiment with sweetness and consistency. I've personally found that popsicles are creamier when they have a thicker consistency, so I like to pour my popsicles when they are about the consistency of a smoothie. Engage your little one by putting him in charge of the blending (from a distance of course) and the pouring into molds, so that he/she can really feel part of the action.